Maison Jenny is one of the hardest couture firms to learn about - but if you look through fashion plates and magazines, she is all over. According to a blog, Jeanne Adèle began working under Jeanne Paquin, and then under Béchoff David (another little-known master). Her own house opened sometime between 1908 and 1910; the sources I've found disagree, but the earliest mention of Jenny that I can find is from 1910, in the caption of a photograph. There is no other text. But her star soon rose. In a 1912 trade magazine, specific Jenny models are noted several times, and in one case she is described as a style arbiter. In a tariff hearing in January 1913, in the testimony regarding a man accused of importing Paris labels for fraudulent purposes, all of the labels are listed - they're listed generally in order of importance, and Jenny's name rests right in the middle, between the geniuses and the unknowns. And, most significantly, a few years later Jenny's designs appeared in the Gazette du Bon Ton alongside Worth, Chéruit, Paquin, and others. From that point on, Jenny was solidly a member of the couture elite, constantly being reported on in trade magazines and the public's fashion press. This fame lasted at least through the early 1920s. (In the 1922 volume of Harper's Bazar, she may be the most written-about of all the couturiers.) Unfortunately, after this point copyright laws kick in and fashion magazines and plates are more difficult to find: one has to rely on secondary sources by people who've been able to read through the periodicals in person, but in the case of Jenny, nobody has cared to. Thank you for this. 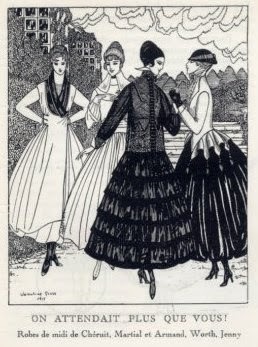 The pattern for my currently-languishing-in-PHD-land 1920s dress was taken from a Jenny dress in Patterns of Fashion, and I did wonder who she was.